It was early morning at our beach house. The watercan was filled, and I was on my way out the patio gate to give the plants a drink when suddenly — hello! — two otters sat on the bank of the salt pond less than 20 feet from where I stood frozen in my tracks. Otters! In New Smyrna Beach! Right next to our house! Although my friend and former beach neighbor once mentioned seeing otters in the salt pond, this was a first-time sighting for me at our Volusia County property. Over the years, I’ve encountered these semi-aquatic mammals several times but always in Lake County in or around freshwater lakes and marshes. Twice I observed them at Little Lake Harris in Howey-in-the-Hills, and I once saw an entire family of otters run across County Road 561 in Astatula. However, most of my previous sightings have taken place at our own lakefront Groveland homestead, especially during a dry spell in the mid-2000s when water levels were low and turtle populations high. 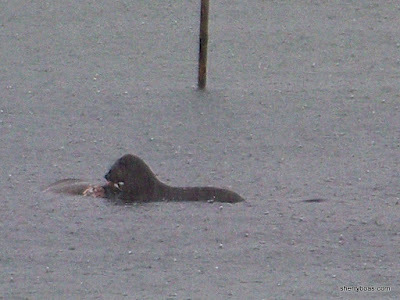 During those years, otters came to feed on the turtles. And feed they did. Anyone who imagines these web-toed, whisker-nosed critters as sweet little cuties hasn’t watched them chew through the flesh of a softshell turtle. It’s a sharp reminder of nature’s brutality. But the two otters that I encountered the other morning by our beach house weren’t dismembering turtles or devouring fish. Their initial focus was on a small swath of unplanted soil beneath our perennial peanut patch. I quietly stepped back through the gate, turned around, put down the water can and ran inside to grab my camera. When I came back — yah! — they were still there. For several minutes, I stood silently still as the otters, an adult and its offspring, rolled in the dirt and preened themselves before leaving land and returning to the water. 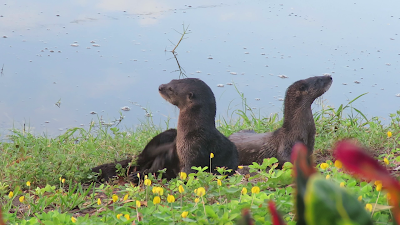 During the entire time, the adult otter — my maternal instincts suggest it was the mother — emitted a series of chirping calls, sounds I’d never heard an otter make. I didn’t realize until the two torpedo-shaped, brown-furred mammals slid off the bank back into the brackish water that a third otter was part of the group. Judging by its size and the way it followed the adult, I assumed this was another offspring out for a morning exploration trip with its mom. Otters are found throughout Florida in rivers, lakes, streams and coastal marshes. They mate in spring and have an 11- to 12-month gestation period. The babies — one to three offspring called kits — are born in waterside dens called holts built into banks or in hollowed trees alongside shorelines. Although adult otters are adept swimmers, kits must learn this essential skill. When they are about two months, they are weaned and their mother teaches them how to swim and hunt for food. Since the two kits I observed were almost as big as their mother, I assume they were already well versed in survival. But by the way the young patterned the adult, it was also obvious that mother otter was still very much in charge. I don’t know when I’ll see otters again. Like most of my wildlife encounters, chance and timing — being at the right place at the right time — play a huge part in determining what I’ll see and when I’ll see it. However, I will be looking for otters whenever I step through our patio gate. And I’ll be listening, too, for the piercing ‘cheep-cheep-cheep’ cry of a mother otter letting her young know where she is and warning them not to stray too far from her or safe waters.